This high-quality Vero wall-mount bathroom sink from Duravit is crafted from ceramic. In an attractive white alpin color, this sink promises long-lasting durability that you'll enjoy for years. Dimensions 34.0 In. X 20.0 In. X 8.0 In. "I am confused: in one place it says drop in and later on it says wall mount. Can it be both? Please clarify. " 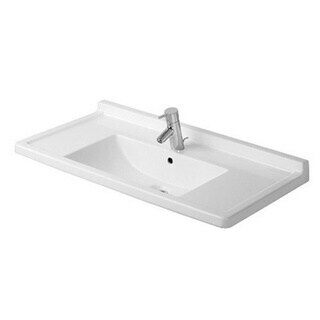 This particular Duravit is meant to be installed on a pedestal in addition to being mounted to the wall.